In the past week, a question came across on StackOverflow for which I created a sample project. The question was: how to make the detail text of a TextCell appear on the right? I started to answer the question, as I do a lot, and quickly came across the UITableViewCellStyle in iOS. I thought it would be as simple as that, but I was wrong.. Now it had me intrigued, because I didn’t implement it myself before and it had no apparent solution. Once I got started on it, I needed to know exactly how things are tied together. And to do even better, I will now share it with you! So, let’s first have a look at the problem challenge at hand. 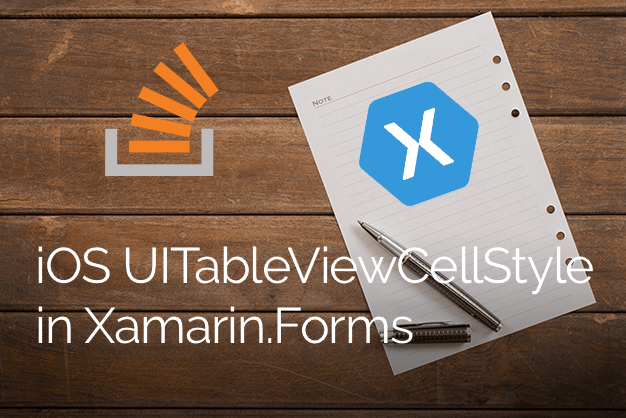 With Xamarin.Forms you get a lot of predefined Cells already, one of which is the TextCell. The TextCell provides you with a simple cell layout to show a primary text and a detail text under it. But for iOS, more variations are possible as we can see on the Xamarin documentation page. Default – supports a UIImageView. Subtitle – supports a UIImageView and subtitle. Value1 – right aligned subtitle, supports a UIImageView. Value2 – title is right-aligned and subtitle is left-aligned (but no image). But how do we access this kind of functionality from within Xamarin.Forms? As you might have guessed, you will need a custom renderer for this. So I created one for a TextCell, and though I could just set the UITableViewCellStyle property I found before and be done with it. Unfortunately, that was not the case. As it turns out, you can only determine the cell layout whenever you instantiate it. And then there is the concept of cell reuse that you take into account as well. Since I only override the TextCell I can safely cast it like this. We then check if there is a cell that we can reuse, if not we create a new one. And that is where the magic happens! Here you see the UITableViewCellStyle.Value1 make it’s appearance. After that we need to set the right properties etc. and return our new cell. And that it that! We now have the effect we were after, you can see it below. All code for this can be found on a GitHub repository. Thanks but, I am confused, what was the actual question you answered?